The CM921 is composed of an internal and an external receiver,using dual channel radio frequency hopping technology. Step 1. Put the binding harness into connector location marked BIND. Next apply power to the receiver. Both receiver and Satellite LED's should illuminate. Step 2. To set fail-safe throttle and control surface positions, (minimum throttle with and all control surfaces set to neutral is suggested). Press the bind button (LED will illuminate). Turn on the transmitter. Step 3. Receiver LED will change from rapid flashing to slow flashing and a few seconds later when bind is accomplished the LED of both satellite and main receiver will illuminate solid. All fail-safes should be programed correctly now. Step 4. Remove binding harness from the BIND channel. Restart the receiver by cycling it's power off and back on. All channels should function properly now. You may test fail-safe by holding sticks in corner, cycle transmitter off. Surfaces and throttle should return to your preset fail-safe positions set in. - The Orange LED on main receiver should flash one time when power if first applied. 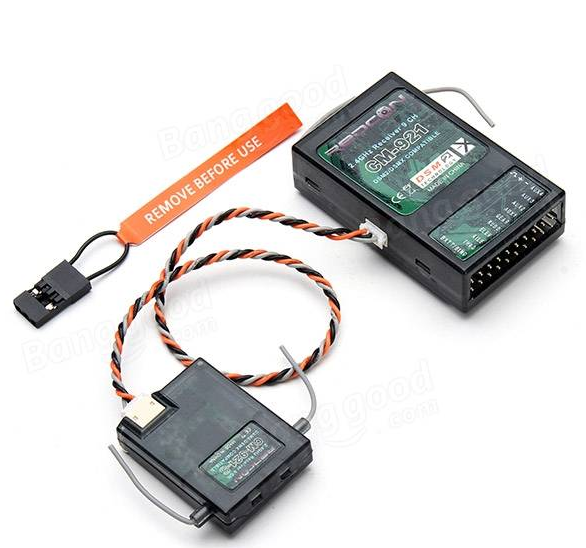 It will flash several times when binding harness is connected. It should stay illuminated if main receiver losses signal but the Satellite is still working.